The RSPB and the British Trust for Ornithology both suggest feeding birds all year round. However, it is suggested that feeding birds during the colder months should be a priority. Dawn and dusk are the key times of day to ensure there is food available, especially during these colder months. 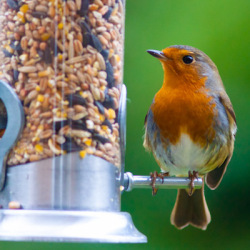 Putting out a good mixed feed on bird tables and in feeders will encourage most urban birds into gardens, providing them with essential energy. We stock a wide range of prepacked and loose bird food including, mixed seed, nuts, sunflower hearts and suet treats. We also have a range of bird feeders and bird houses.